Iranian First Vice President Es’haq Jahangiri has criticized the West for using the issue of human rights as a political tool for its own gains. 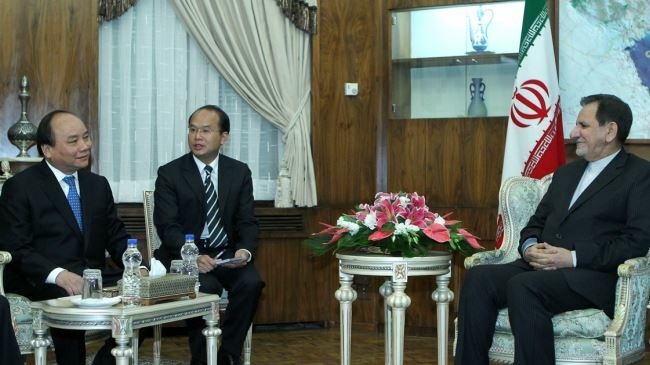 The Iranian official made the remarks in a meeting with Vietnamese Deputy Prime Minister Nguyen Xuan Phuc in Tehran on Tuesday. Jahangiri also called on independent countries to confront the West’s double standards towards the issue of human rights. He expressed misgivings over the emergence of violent militant groups in the Middle East, which pose challenges to regional nations, and voiced hope that the international community would take action to settle the issue. Jahangiri also called for further development of all-out ties between Tehran and Hanoi and said Iran considers no restrictions to the expansion of ties with Vietnam. The Vietnamese official, for his part, said his country attaches great significance to ties with Iran and seeks constructive relations with the Islamic Republic. As the rotating president of the Board of Governors of the International Atomic Energy Agency (IAEA), Vietnam supports the ongoing talks between Iran and the P5+1 group over Tehran’s nuclear energy program, he added. He also backed Iran’s access to peaceful nuclear technology. Iran and the P5+1 kicked off a new round of nuclear talks in the Austrian city of Vienna on Tuesday. The two sides have agreed to extend the talks for the third day on Thursday. This round of talks is the eighth this year between Iran and the six countries of Russia, China, France, Britain, the US and Germany.